Fall-In Saturday in the HAWKs Room | H.A.W.K.S. Chris Palmer I was only able to get up to Fall in for Saturday and Sunday this year, so only have shots of some of the Saturday games we ran in the HAWKs room. Sunday, I sold in the flea market. I had a great time at the con, and the crowd and energy seemed at a higher level than I have seen in a while. 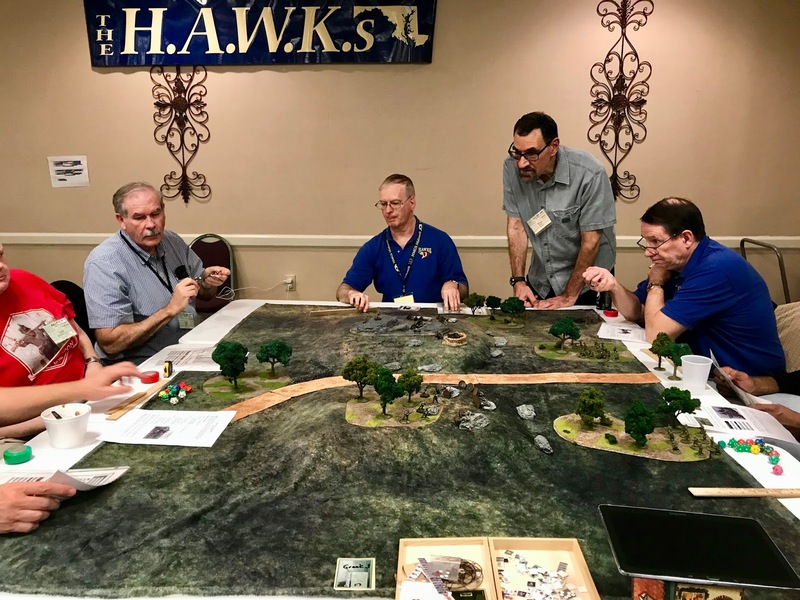 All the HAWKs games had players enough to run, even the hard-to-fill Saturday night sessions; and the newly-redesigned Dealers’ Hall seemed to be humming with activity when I was there. 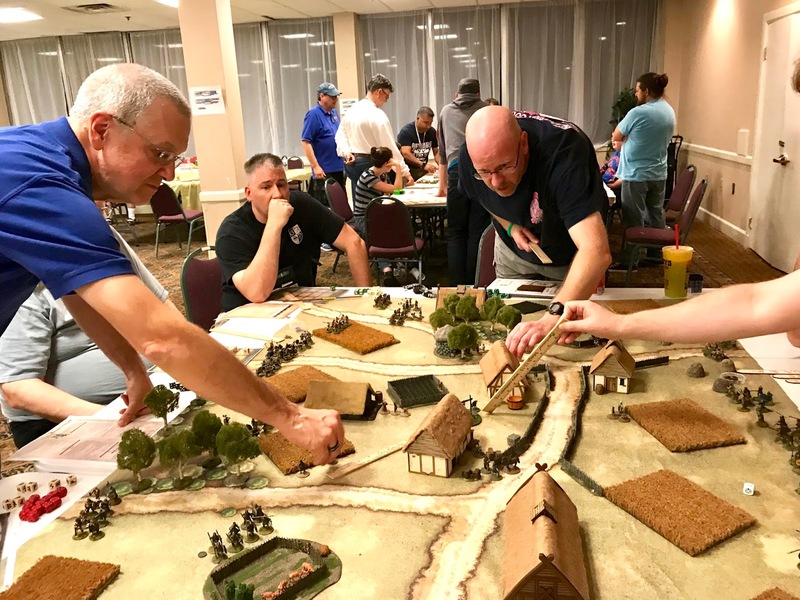 There were very few visible improvements to the Lancaster Host still, other than the Dealer’s Hall, and the new white plastic tables everywhere, that replaced the old wooden splinter-and-staple infested ones. But signs like the absent boiler truck, and no more roof tarps, are indicators steps are being taken in the right direction down a very long road. On the down side, most of the reports I heard of the food quality were poor; and the water dispenser, moved from the hallway into the HAWKs room itself, never seemed to be refilled after it’s initial reserves were exhausted on Friday. 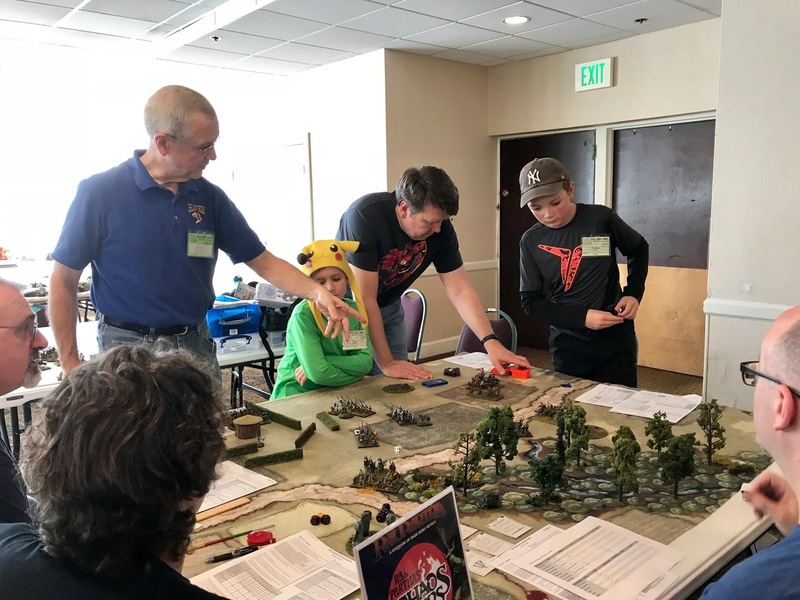 The flea market was humming; and at the Sunday session that I did, every table was filled with a seller, and some folks even had to drag some of the tournament tables over into a new ad-hoc sellers’ row to make more space . 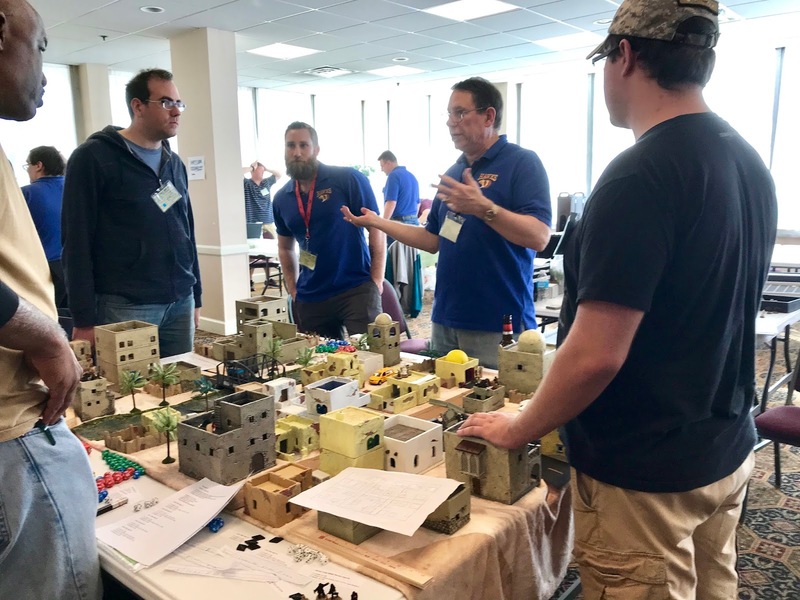 For the report on the linked, 2-part special episode, Doctor Who games Greg Priebe and I ran, please see: Doctor Who and the Pirates of the Cyberiad Main. 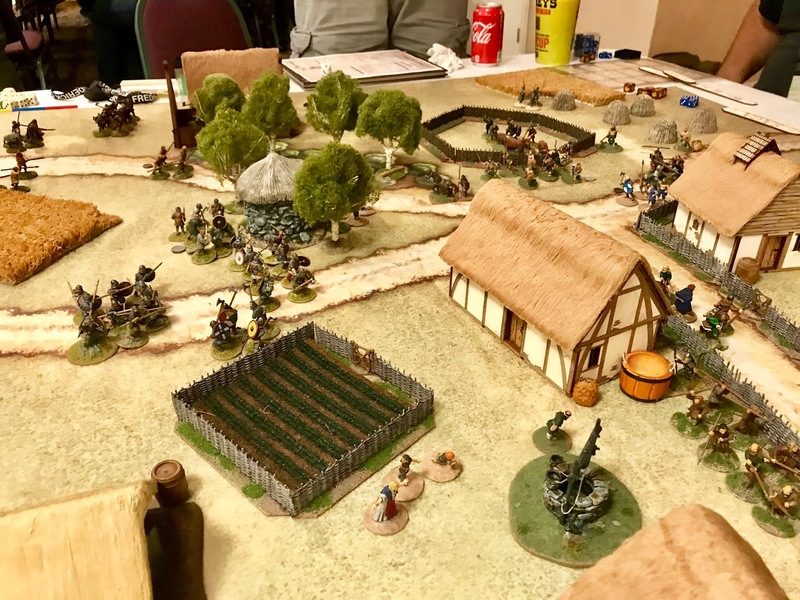 Eric Schlegel’s “Action on the Pratzen” 15mm Napoleonic game using “Le Feu et Fureur” modified Fire and Fury rules. Geoff Graff’s Lego Pirate game is always a favorite with the kids, using Plastic Pirates rules. 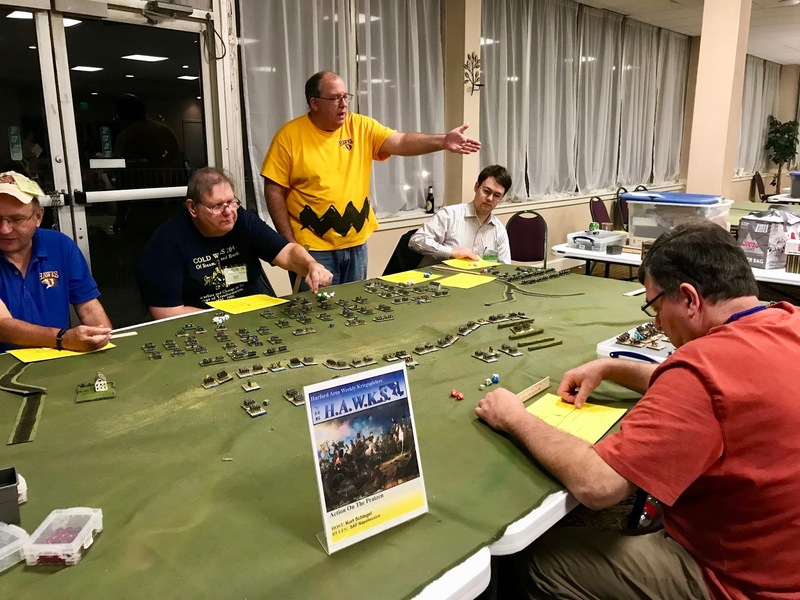 Rob Dean running his Chaos Wars fantasy game with 25mm figures. 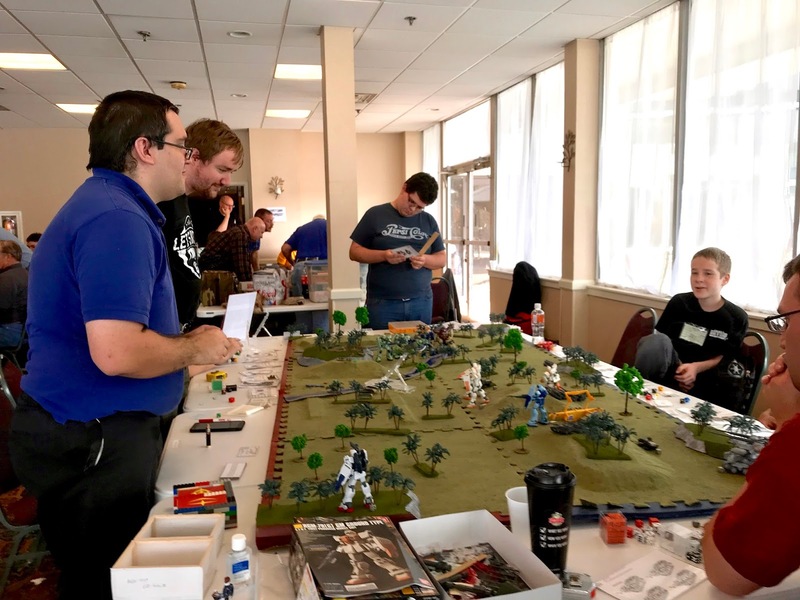 Kevin and Mike Fischer’s “Welcome to the Jungle” 12mm Mobile Suit Gundam game. 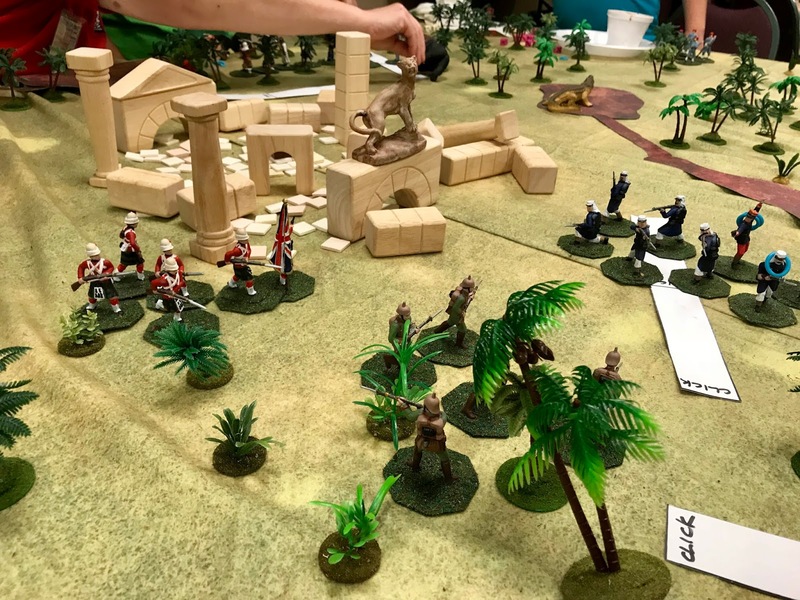 Chris Johnson’s “Gorilla My Dreams I Need You” 54mm Pulp kids game using Valley of the Ape rules. A close up of some of Chris’ beautiful big figures. 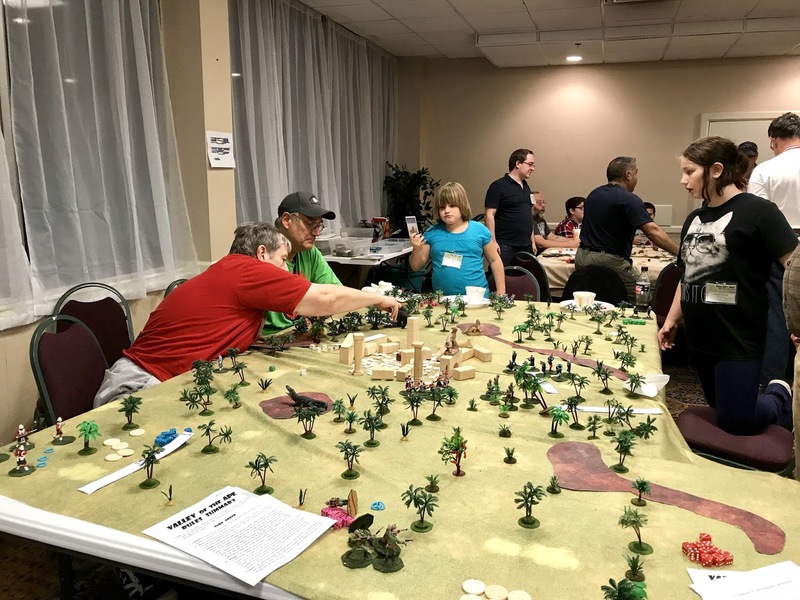 Bill Molyneaux’s “Zulu Morning Patrol” game using home rules. 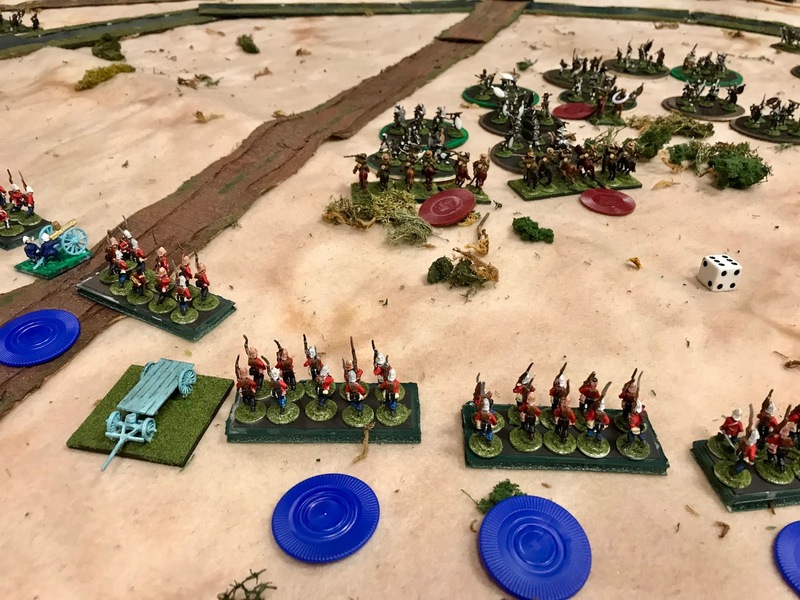 A closer shot of some of Bill’s brave British preparing to meet the Zulus. 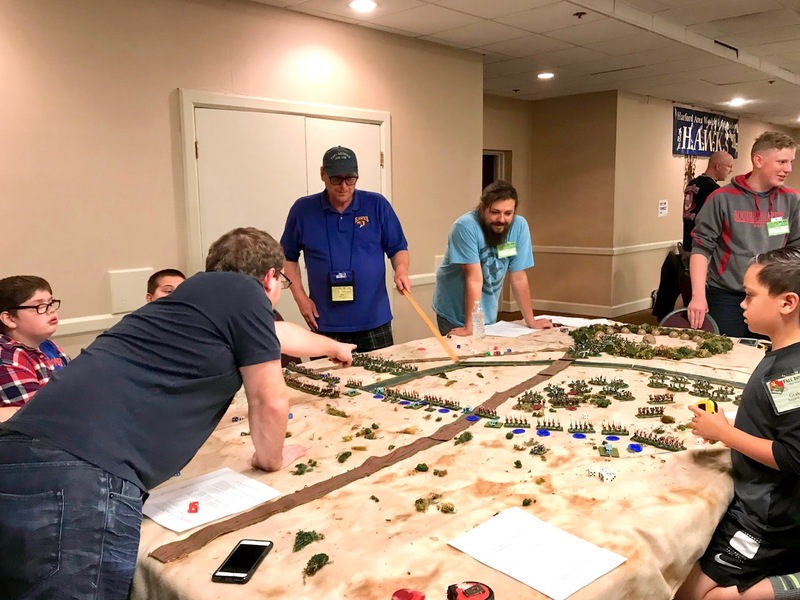 Kurt Schlegel’s reprisal of the “Action on the Pratzen” scneario, this time using his Fast and Fun Napoleonics rules. 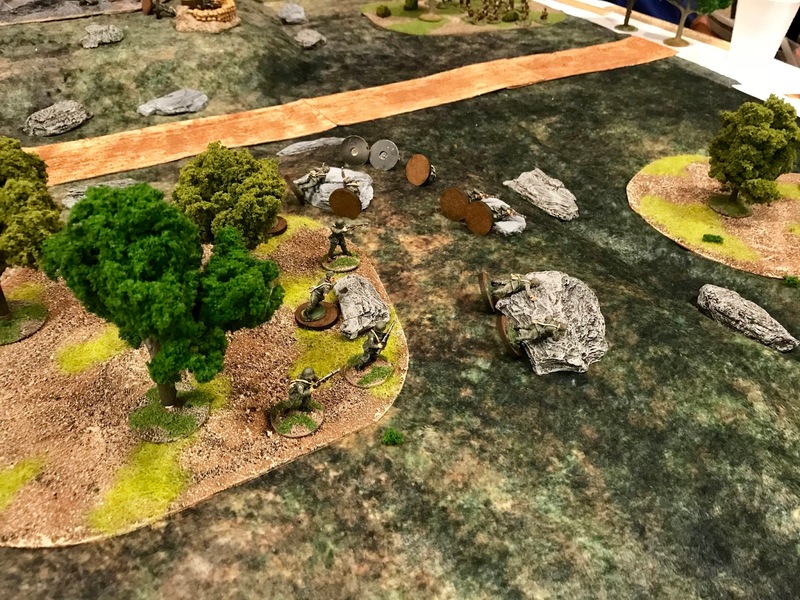 Don Hogge’s “All or Nothing” WWII game featuring Greek’s vs Italians, and using Battleground WWII rules. 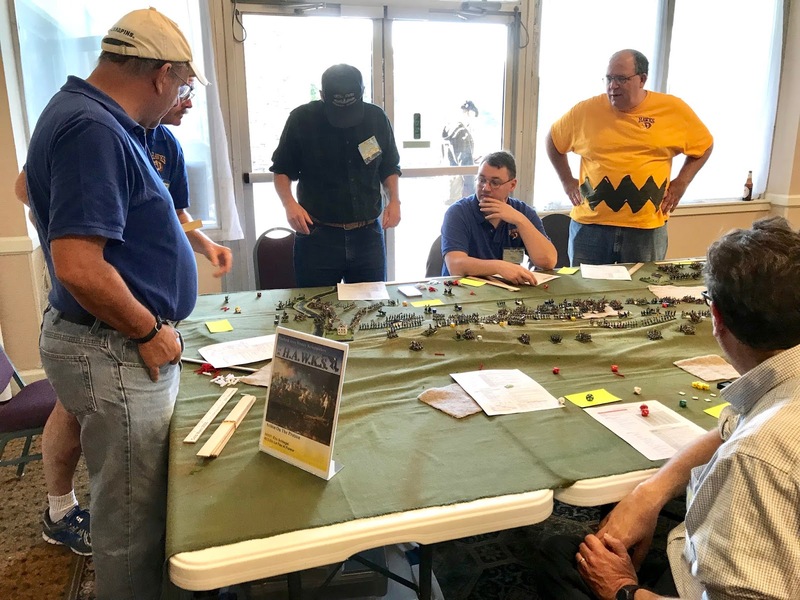 Jim McWilliams “Saga of Lower Uncton Continues” game, using SAGA rules. A close up of some of the Dark Age forces battling in Jim’s game. 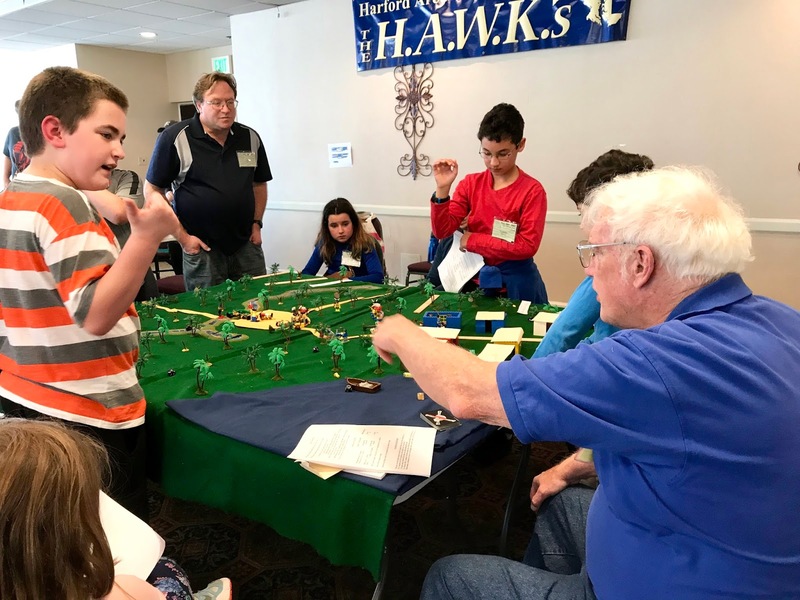 A big thank you goes out from all the HAWKs Gamemasters to all the great players who came by our room to take part in our games! We hope to see you all at Cold Wars! I wish I had been there. It looks like it was a lot of fun! Yeah, this was a pretty good con. I wish you could’ve been there too. I have to say the HAWKs room just didn’t feel right with you not there.